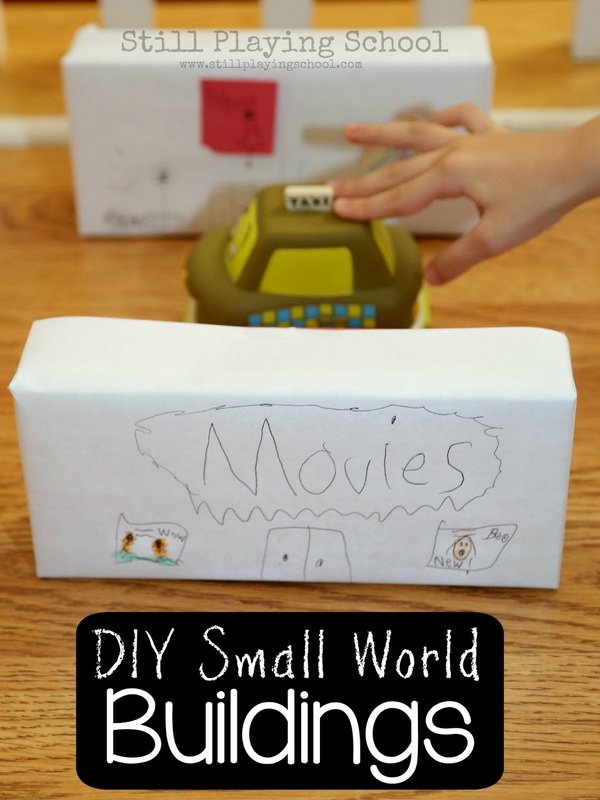 Our kids love small world play! We set out an invitation for them to create their own buildings since we've been learning to identify places in our community. This creative project also showed just how much they've noticed about our neighborhood! We created our blank buildings by wrapping our brick cardboard blocks with white printer paper. You could also wrap empty food packaging boxes but if you're in the market for fun blocks we use these regularly for all sorts of pretend play so they are totally a worthy investment for kids! The paper didn't completely cover the blocks but it didn't matter to us since we were only decorating once side. You could use two pieces of paper if you wanted complete coverage. The wrapping practice was excellent fine motor work for our daughter, too! We secured the paper with Scotch tape which all kids love to use for some reason. Our daughter spent the morning decorating her buildings quite creatively. I forgot to snap a picture since I was busy getting other things done with her so happily occupied! She created a church, a school, and a movie theater. The details are too cute! 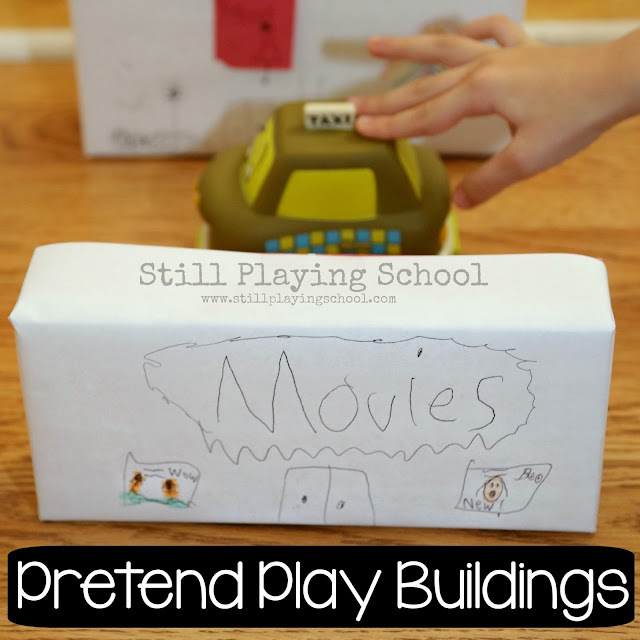 I imagined that our kids would use the buildings for vehicle play but E grabbed her Squinkies which were the perfect size for these neighborhood places! She even set up the "inside" of each location behind the block with small accessories and dollhouse furniture. 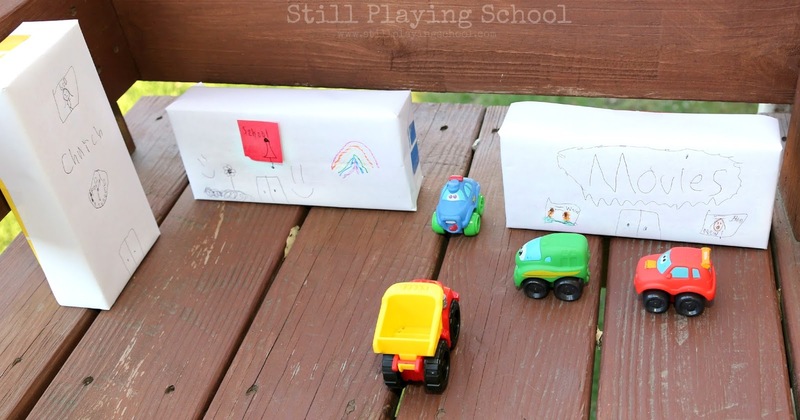 Who knew a simple invitation to create would inspire so much creative play! Those blocks look awesome. We make "Small" worlds with our small building blocks but it would be fabulous to have some bigger blocks to use. Sucha a clever way to repurpose a toy. My boys love all play related to cars and trucks. Great idea! 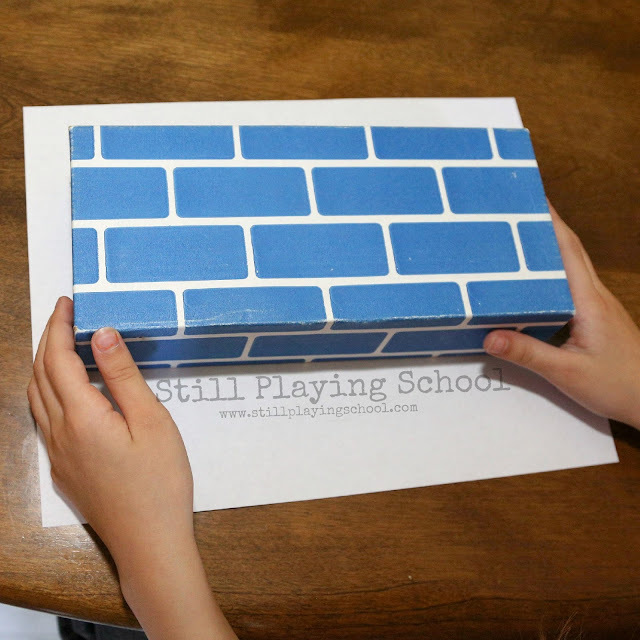 We have those cardboard blocks and I know my kids would love this! 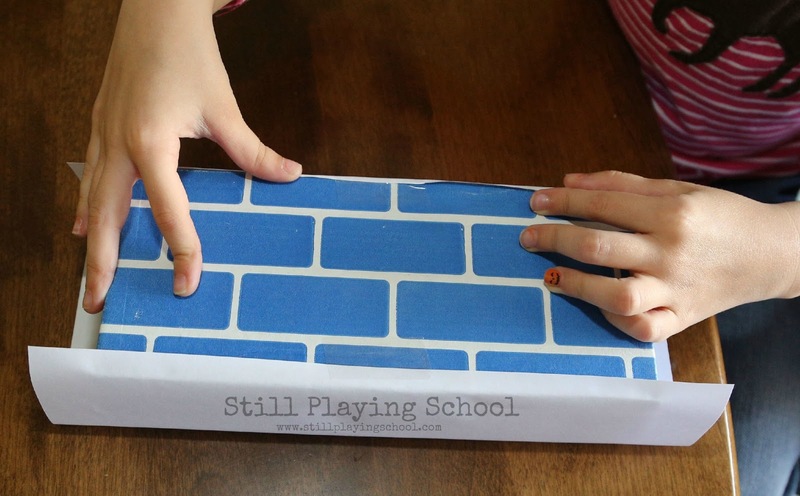 Love the idea to use those blocks in a new way!